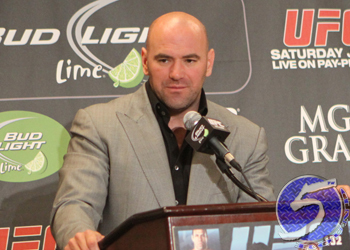 If posting a 2-1-1 record against Maynard is Edgar’s lifelong goal, which it likely isn’t, UFC president Dana White (Pictured) professed there will not be a fourth tango between the two – regardless of what goes down during their trilogy this Saturday. “[We’re going to] put it behind us. Move on,” White said during Wednesday’s press conference. “This division is stacked with tons of talent, and there’s a lot of good fights to make at 155. When Edgar steps into the Octagon inside the Toyota Center in Houston, Texas, it will mark the second straight immediate rematch he was forced to issue. Prior to his UFC 125 scrap with Maynard, the Jersey boy beat former champ BJ Penn in back-to-back outings. Although arranging an immediate mulligan between Edgar and Maynard wasn’t the ideal scenario for the division, White felt he had no choice but to grant Maynard another opportunity. “I just remember going, ‘Oh my God, a draw,'” White said of his reaction this past New Year’s day. “At the press conference, what I do remember is when I said we’re going to make another fight, and how upset [Gray] was and how he really wanted this fight again. So we did. We felt he was deserving, so we made this fight. Edgar vs. Maynard III will headline this weekend’s pay-per-view broadcast.